The PDC welcomes you to use the information from our website in your stories. View the links below to see the PDC’s press releases. If you have questions or would like more information regarding these press releases, please email info@pdclegal.org or contact our offices at 703-506-2027 to speak with our PDC staff. 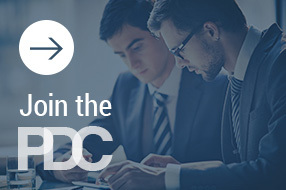 The Professional Development Consortium (PDC) is a group of individuals working at law firms, government agencies and corporations who are responsible for developing and administering training and continuing professional development for lawyers. In existence since 1990, this collegial group enjoys sharing ideas, strategies and best practices to improve the performance of lawyers and the profession. The PDC aims to provide a forum for the exchange of ideas about the development of programs, materials and resources that will help PDC members provide high quality training and professional development programs within their organizations, as well as to assist in the ongoing professional development of its members.